After bagging the idea of doing some skiing and scoping in the Beartooths Zana and I headed down to our favorite sports climbing destination: Ten Sleep, WY. For some reason we decided re-enact our 20s and drove down at 11 pm on Friday night. Interesting. Beautiful climbing as always in Ten Sleep, plus being the off-season we saw virtually nobody. My power and endurance are very low due to the massive amount of skiing I did over the winter combined with virtually no climbing. As much as I love the climbing in the Batholith it just doesn't prepare one for 100' pocketed endurance routes. Nonetheless, we got 3 solid days of climbing in with 2 days at the French Cattle Ranch and the first day exploring Leigh Creek. We ran into Fruh and Rose down there the first night and climbed a little bit with them on the second day. 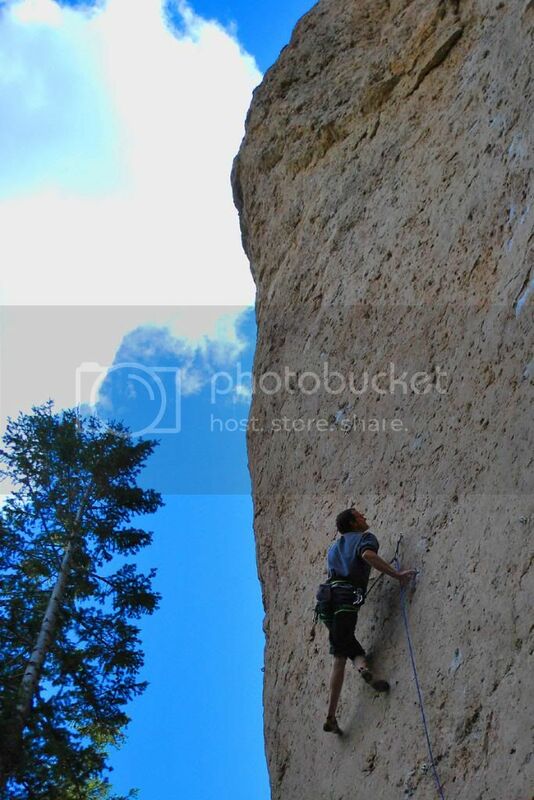 Fruh seems motivated to climb again as demonstrated by easily sending Hellion .13c at the Supererratic Wall. On a side note. It seems in the quest for 5.14s the keepers of Ten Sleep are going to resort to "grid-bolting". In the past couple of years more and more squeeze jobs keep going in at some classic zones such as the French Cattle Rance and the Supererratic. With miles and miles of beautiful stone at their fingertips it does seem a little harsh to be putting bolt lines within 4' of each other. I'm thinking of making my first trip to Ten Sleep this summer. Any advice on good places to stay (camp or otherwise)? It doesn't need to be free necessarily although if there is a decent free option we'd try that. Thanks! The camping along the old highway (southside of creek) is free and pretty good once its warm out. There is tons of FS camping a few miles up from the Mondo Beyondo, but lots of RVers/ATVers too. We stayed at the sites at Leigh Creek low down in the canyon for the first time on this trip. They are great, but require a little more driving. Grid-bolting in ten-sleep?! I thought they used a machine gun set up for equipping the 'land of a million bolts'? A machine gun is what they might have and no sense perhaps. Its amazing (the bolting). Its becoming the green route, blue route, red route. Just imagine what Fruh would do if he actually trained and focused on climbing for a few months in row. Scary?